The iconic Palace on Wheels was launched in 1982, making it the oldest of India's luxury trains. Indeed, the newer luxury trains in India have aimed to replicate its success. The train was conceptualized to utilize carriages that India's royal rulers and the Viceroy of British India had traveled in. You'll feel regal indeed, as you journey in style through Rajasthan, and visit the Taj Mahal. In September 2017, the Palace on Wheels commenced running with new yellow carriages. 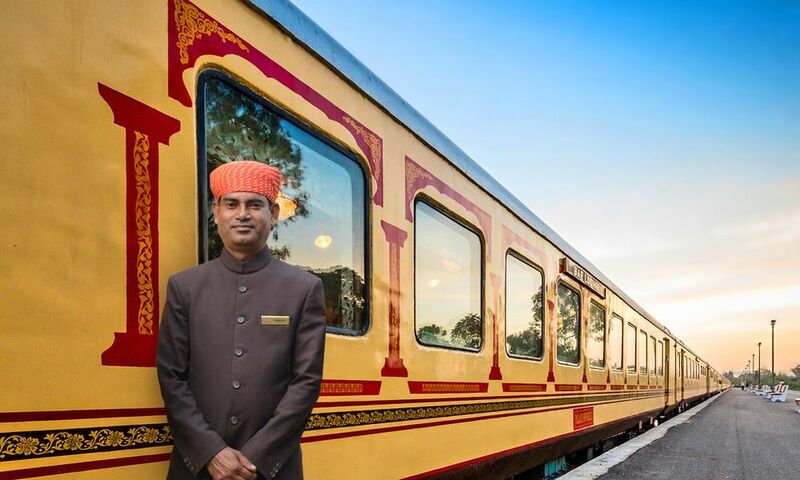 The carriages were taken from the opulent Royal Rajasthan on Wheels, which is no longer operating due to lack of patronage, and refitted to recreate the feel of the Palace on Wheels. Notably, they're more spacious and luxurious than the train's previous ones, which were revamped in 2015 following complaints about worn interiors. Bathrooms have also been upgraded and the cabins given a makeover with more contemporary look. The Palace on Wheels is jointly operated by Rajasthan Tourism and Indian Railways. The train has 13 carriages with 39 deluxe cabins, and one carriage with two super deluxe cabins. The carriages (known as saloons) are named after princely states of Rajasthan, and each is uniquely decorated in regal style in accordance with the theme. Expect vibrant colors, opulent mirror work, miniature paintings, antique furniture, and silk fabrics. The cabins are named after famous palaces in Rajasthan and each has a Rajasthani-attired attendant (called a khidmatgar) that's available around the clock. Facilities in the cabins include built-in wardrobes, safe, TV, DVD player, piped music, telephone, and attached bathrooms. In addition, there are two restaurants (named Maharajaha and Maharani), a lounge where guests can mingle and enjoy the passing scenery, bar, Ayurvedic spa, souvenir shop, and wireless Internet. The Palace on Wheels runs from September until the end of April each year. It stops during the very hot and monsoon months. The train departs Wednesdays at 6.30 p.m. from Safdarjung Railway Station in Delhi. It visits Jaipur, Sawai Madhopur (for Ranthambore National Park), Chittorgarh fort, Udaipur, Jaisalmer, Jodhpur, Bharatpur and Agra (for the Taj Mahal). Highlights include a camel ride in the sand dunes at Jaisalmer followed by dinner and a cultural show, a sound and light show at Chittorgarh, and lunch at Fateh Prakash Palace hotel in Udaipur. Seven nights. The train arrives back in Delhi at 6 a.m. the following Wednesday. There are separate rates for foreigners and Indians. Rates also vary according to peak season (from October to March) and lean season (September and April). Peak season, deluxe cabin, single occupancy: $6,055 per person. Peak season, deluxe cabin, double occupancy: $4,550 per person. Peak season, super deluxe cabin, single occupancy: $12,600 per person. Peak season, super deluxe cabin, double occupancy: $6,300 per person. Low season, deluxe cabin, single occupancy: $4,550 per person. Low season, deluxe cabin, double occupancy: $3,550 per person. Low season, super deluxe cabin, single occupancy: $12,600 per person (no discount). Low season, super deluxe cabin, double occupancy: $6,300 per person (no discount). Peak season, deluxe cabin, single occupancy: 3,63,300 rupees per person. Peak season, deluxe cabin, double occupancy: 2,73,000 rupees per person. Peak season, super deluxe cabin, single occupancy: 7,56,000 rupees per person. Peak season, super deluxe cabin, double occupancy: 3,78,000 rupees per person. Low season, deluxe cabin, single occupancy: 2,73,000 rupees per person. Low season, deluxe cabin, double occupancy: 2,10,000 rupees per person. Low season, super deluxe cabin, single occupancy: 7,56,000 rupees per person. Low season, super deluxe cabin, double occupancy: 3,78,000 rupees per person. Rates include accommodation, meals (a mix of Continental, Indian and local cuisines is served), sightseeing tours, entrance fees to monuments, and cultural entertainment. Service charges, tax, laundry, tips and drinks are additional. You can make a reservation for travel on the Palace on Wheels online here, or via a travel agent. Should You Travel on the Train? It's an excellent way to see many of the popular north Indian tourist places in comfort, without typical hassles such as dealing with transfers and touts. The excursions are well-planned and cover the important sites, including two national parks and many historical attractions. Passengers come from all over the world, giving the train a cosmopolitan feel. However, instead of traveling on the train, some people prefer to stay at luxury hotels and hire a car and driver, as it gives them more flexibility. In this regard, there are some disadvantages of the Palace on Wheels. One of the main drawbacks is the frequent scheduled shopping stops where commissions are earned. The merchandise is unreasonably expensive and many tourists simply pay the asking price rather than haggle. The price of alcohol aboard the train is also very high. If you're traveling in the winter months, from November to February, be sure to bring warm clothing (including hats and gloves) to wear on safari at the national parks. Mornings are cold and transport at the parks is open-air.